[Q] This was this done when you were at Glasgow, in the Vet School? That's right, in the Vet... in the Vet School, yes. If you stimulated acid that with histamine, maximally, the maximum output of histamine stimulated secretion, and now you put in the 5-HT, we could shut the secretion right down and bags of mucus were produced. The late Scottish pharmacologist Sir James W Black (1924-2010) revolutionised medical treatment of hypertension and angina with his invention of propranolol, the first ever beta blocker. This and his synthesis of cimetidine, used for the treatment of peptic ulcers, earned him the Nobel Prize in Physiology or Medicine in 1988. After graduating with a BSc Bill Duncan went on to gain a PhD from Edinburgh University in 1956. He joined the Pharmaceuticals Division of ICI where he contributed to the development of a number of drugs. In 1958, he started a collaboration with Jim Black working on beta blockers and left ICI with him in 1963 to join the Research Institute of Smith Kline & French as Head of Biochemistry. 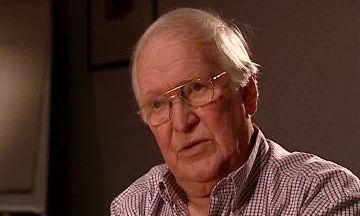 He collaborated closely with Black on the H2 antagonist programme and this work continued when, in 1968, Duncan was appointed the Director of the Research Institute. In 1979, he moved back to ICI as Deputy Chairman (Technical), a post he occupied until 1986 when he became Chairman and CEO of Coopers Animal Health. He ‘retired’ in 1989 but his retirement was short-lived and he held a number of directorships in venture capital backed companies. One of his part-time activities was membership of the Bioscience Advisory Board of Johnson and Johnson who asked him to become Chairman of the Pharmaceutical Research Institute of Johnson and Johnson in New Jersey. For personal reasons he returned to the UK in 1999, but was retained by Johnson and Johnson until 2006 in a number of senior position in R&D working from the UK. From 1999 to 2007 he was a non-executive director of the James Black Foundation. He is now fully retired.